We have some old issues of The Jyotish Digest available for download for our members. Thank you so much for supporting the cause of Sri Jagannath Center in bringing out this quarterly magazine. Then we learn how to check which is stronger – lagna or seventh from āruḍha; what are the implications of the shifting of āruḍha. After some discussions it has been decided to defer the Bala Jyotiṣa Course for another time as there is a lot of pressure from other courses like the Parāśara Jyotiṣa Course and the Śiva Mahāpurāṇa Course. In the meantime to ensure that studies in Vedic Astrology continue with joy we have decided to have informal classes in Delhi, whenever the teachers are available. Topic for the next class shall be decided at the end of every class. Devaguru Bṛhaspati Centre (DBC) announces its series of Vyāsa Workshops to be held at Delhi, India. The first theme for this series is Marriage and Relationships which are, perhaps, the greatest challenge facing our times today as women try to carve a new role for themselves in society and men seek working partners and have various desires, little known to them. Every aspect of life is touched inconsiderable detail as a new bond is made. This implies every bhāva affecting the seventh bhāva of relationships in some manner or the other as well as the navāṁśa. Yet before we venture into the varga and other deeper subtleties of relationships, we need to understand the rāśi chart itself. Matching is not just a guṇa score where the traditional belief that a high score indicates great marriage has already been proved to be so wrong. We plan this for a future workshop where we shall study guṇa matching in some detail. Our plan for the start is to do some useful jyotiṣa where we are going into the teachings of the purānic jyotiṣa. ④ Sukha Bhāva: Marriage cannot last if either of the couple is suffering inside, and worse they don’t know why they suffer or what they seek in marriage. The effect of the ‘bhavat bhāvam’ principle. This workshop is not for rank beginners. You need to have some working knowledge of jyotiṣa like the twelve rāśi, their lords and natural friendships and nature of the graha (planets). (1) Propagation of the essential philosophy of Hinduism and Jagannath Culture. (2) Providing shelter to pilgrims coming to Puri. (3) Providing accommodation / financial help to poor and meritorious students. (4) Participating in various rituals of the temple of Lord Jagannath. As reported in the Puri Gazetter (1929) the “Mathas are monastic houses originally founded with the object of giving religious instructions to chelas or disciples and generally of encouraging a religious life.” The heads of the Mathas are called Mahantas or Mathadharis. They are generally celebrates but in certain Mathas married men can become the Mahantas. They are generally selected from among their ‘Chelas’.Some mathas were set up for defence purposes. King Narasingh Dev-1 established 4 mathas (‘Akhadas’)namely Bagha,Khaki,Hati and Nirmohi mathas with strong valiant Sadhus to guard the temple.As per the said Gazetter ” there are over seventy mathas in Puri town.” The Mathas are affiliated to different sects of Hinduism,namely Angira sect, Adwait sect,Ramanandi sect,Ramanuja sect,Atibadi sect,Gaudiya sect,Pancha Ramanandi sect,Gauda Mahaba sect,Nimbarka sect,Anant sect,Utkal Vaishnab sect, Madhabacharya sect,Dashanami sect,Pustimarga sect.etc.There are also some mathas belonging to the Gurunanaka sect and the Kabir sect. Most of the Mathas of Puri have ritual relation with the Sri Jagannath temple. It is so to say the pleasure garden of Lord Jagannath.The “Bije pratimas” (the representative images) of the Lords visit this Matha on different festive occasions like “Basanta Panchami”,on the 1st,4th,5th,and 12th days in the bright fortnight of Falguna.This Matha supplies flower-ornaments like ’tilak’and ‘jhumpa’ for Baddasinghara besha and supplies ‘Kora’ (a sweet food) for ‘Kaliya dalana’ and ‘Pralambasura badha’ beshas.It also supplies’dayana’ for ‘dayana chori’ ritual. This Matha situated on the grand road has a trust board under the administrative control of the Endowment Commissioner of the State. It has no Mahanta. It is situated near the southern gate of the Jagannath temple.This Matha supplies ‘tahia’ on Snana purnima,Car festival,Return Car festival and Niladribije days.It supplies a part of the Hati besha.It supplies ‘tuli’for pahandiand a certain quantity of sandal wood for ‘Sarbanga’neeti on ‘Khalilagi ekadasi.It also supplies flower garlands for ‘Nabanka bedha’ and offers ‘adhara pana bhog’ and ‘panti bhog’ on certain festive days. This Matha is responsible for supply of the materials for certain rituals. It supplies,’trimundi chandua’ and silk clothes for ‘ Chaka apasara’,repairs ‘Kanakamundi’.It also supplies till oil for Phuluri neeti, oil and ghee etc.for ‘Deva deepawali’,offers ‘Chakata bhog’in ‘Anasara’ and adharpana bhog’ and ‘Panti bhog’on certain days. On Neeladri bije day,the Mahanta makes ‘majana’ of ratnavedi. This Matha was set up by Atibadi Jagannath Das,a poet-saint of Orissa in early part of the 16th century. It was established by the Saint Ramanuja. This Matha supplies ‘Chandrika’and ‘Chausara’ made of flowers for the Badasinghar besha of the Lords,’Mala’ and ‘Chula’ for the ‘nabanka’ ritual.It offers ‘Pana bhog’during the Chandan Yatra, ‘Chakata bhog’ during the ‘anasara’ period and ‘bala bhog’ during the month of Kartika. This Matha supplies a part of ‘Hati besha’ on the Snana Purnima day and ‘ makara chula’ on the Snana Purnima and Makara sankranti days and offers panti bhog. It was established by the great Sankaracharya in the Swargadwar area.Puri became one of the four important ‘dhamas'(places) of Hinduism because of the establishment of this Matha by the great Saint. The head of this Matha also known as Sankaracharya is the permanent head (nayak) of the Muktimandap of the Sri Jagannath temple by virtue of his position.The temple authorities use to consult him in religious or ritual matters when ever necessary. Situated in front of the temple. Performs ‘Kirtan’ at the time of ‘mangala alati’ and ‘pahuda alati’ and bala dhupa.Padma besha of the Lords is done and ‘Kshiri bhog’ offered by this Matha. It supplies flower ornaments like ‘alaka’and ‘chausara’ during the Chandan Yatra, makes ‘majana’ of ‘ratnavedi’ at the time of ‘banakalagi’,supplies ‘adhibasa jala’ from the well of Sitala fof Snana purnima rituals,and offers ‘panti bhog’to Dola Govinda at tthe time of ‘Agniutschaba’.The Mahanta of this matha also happens to be the mahanta of Darpanarayan Matha. 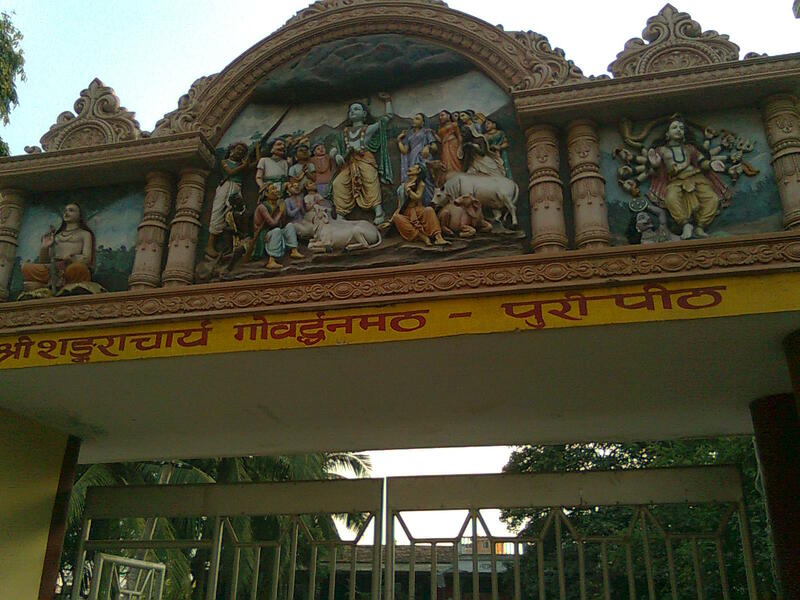 It is located by the side of the Emar Matha. It is associated with the memory of Guru Nanak.This Matha supplies a ram for ‘bali'(sacrifice)before the Goddess Bimala,each year on Mahanabami night.There is another Matha of Guru Nanak sect,known as Baaul Matha. The other Maths connected with the affiars of Sri Jagannath temple are Sri Ram Das (Dakhina parshaw)Matha,Uttara parshaw Matha,Trimali Matha,Mahiprakash Matha,Sankarananda Matha Gangamata Matha,Gangamata Matha,Radhaballav Matha,Labanikhia Matha,Chhauni Matha,Jhadu Matha,Papudia Matha,Nebal Das Matha, Devagiri Matha,Pipili Sadabarta Matha,Sanachhata Matha, Jhanjapita Matha,Samadhi Matha,Balaram Kota Matha,Badasantha Matha,Ramji Matha,Sidhabakula Matha,Venkatachari Matha,Narasinghachari Matha,Ghumusara Matha,(now in ruins),Radhakanta Matha,(Sri Chaitanya visited Puri in 1510 AD and stayed in this Matha.Some of his personal belongings have been preserved in this Matha).Kothabhog Matha,Mahabir Matha etc.The mahantas of these Matha are entitled to perform ‘Upachara Chamara seva,but most of them are not doing the seva. The Mathas are under the control of State Endowment Commissioner.There are two Mathas under the Sri Jagannath Temple Managing Committee. They are Chaulia Matha and Delhi Nalak Ram Das Matha (near Gundicha temple).There is another Matha known as Sata lahadi Matha in the Swargadwar area.It is the burial place of Atibadi Jagannath Das,author of the Bhagabata purana in Oriya.This Matha is being managed by a committee under the Chairmanship of Collector,Puri.Another Matha located in the same area is the Kabir choura Matha,associated with the Kabir sect. It is said that Kabir,the mystic poet stayed here when he visited Puri.There are some other Matha unconnected with the rituals of the Jagannath temple like Chaitanya Goudiya Matha,Purusottam Goudiya Matha,Panjabi Matha etc.Many Mathas have stopped performing services in the temple and those who perform now,do so to a limited extent.Some of the Mathas are entitled to get ‘Khei'(a portion of the Kotha bhog) of the temple. 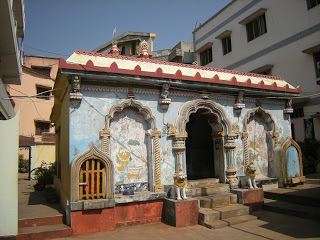 Outside Puri town, there is another Matha in the Kakatpur village area,known as Deuli Matha which is connected with the Nabakalebar ceremony of the temple. 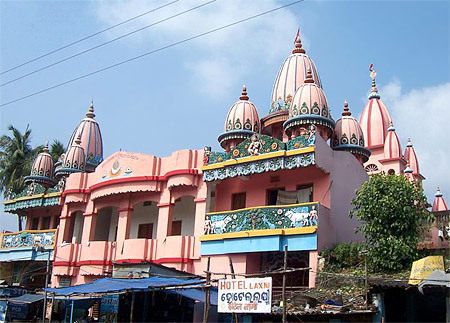 Connected with certain rituals of the temple of Jagannath,there are four Ashrams (hermitages) in Puri town.These are Angira Ashram,Pandu Ashram, Markandeya Ashram and Parasara ( Ugrasena)Ashram. On the ninth day of the bright fortnight of Sravana,the Nrusimha deity of the Sri Jagannath temple pays a visit in a ceremonial manner to these four Ashrams.This is called ‘Badi Nrusimha bije’.’Sital bhog’ is offered to the Deity in each Ashram.On the full moon day of Margasira,Nrusimha again visits these places.On the full moon day of Sravana,Lord Sudarshan visits all these Ashrams. These Ashrams are being managed by different local committees. There are some other Ashrams not ritually connected with the Sri Jagannath temple.Some of those Ashrams are Bijaya Krushna Goswami Ashram(near the Narendra tank),Adwait Brahmashram (Girinarbanta), Omkarnath Thakur or Neelachal Ashram (Swargadwar area), Karar Ashram (founded by the great Kriya yogi Sri Yukteswar Giri, (Swargadwar area)Bharat Sevashram (Swargadwar area),Pranabananda Ashram (near Chakratirtha),Satsangha Ashram (Chakratirtha road),Nigamananda Ashram (Lokanath road),Dibyadham Yogashram (Chakratirtha road),Maa Anandayamayi Ashram (near Swargadwar), Abhiram Paramahanshashram (marichikote lane), Bhagabat Ashram (near bus stand),Haridas Ashram (Sarbodaya nagar).